The Paper Ninja – Welcome to the Dojo. Martial arts, history, politics and movies - but mostly martial arts. 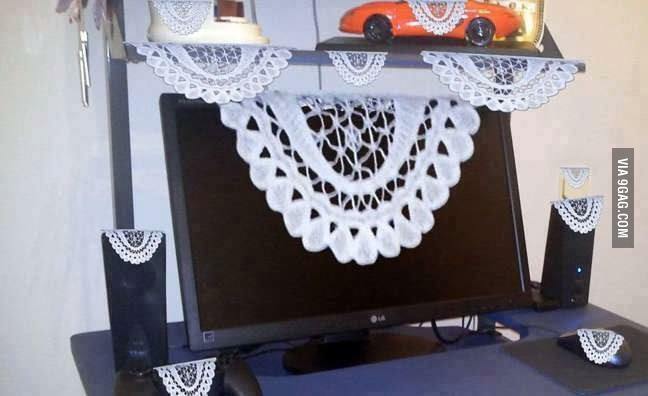 It all began with a doily, and a vase. My yaya, a woman who has caustic wit and very thin eyebrows, had come over from Cyprus to stay with us. Two days into her visit, the world’s ugliest vase (origins unknown) and a crocheted doily suddenly appeared and made themselves comfortable upon a stylish Art Deco table more fitting to the house’s décor. Basically, this is all grandmothers. My father returns from work, knows this instantly to be the work of his mother (whose taste remains in the 50s) and hides it away, for he is a good son and doesn’t wish to upset his mother by destroying the vase. The next day, the vase has returned avec hideous doily, and sits, bold as a stripper in church, in the hallway. It is again removed that afternoon to a new hiding spot. The next morning, it was back like a rash, and it popped in and out of hiding like a mole on amphetamines. If there’s any advice I’ve ever taken from my family (which is not much, I grant you, because then otherwise I would have studied French and Law and maybe been a more respectable adult), it’s this: if you ever want anything, you keep going until they get tired first. Whether it’s a black belt, a promotion, selling your book to a publisher, you keep going. Because as long as you’re not tired, you’re not done. Be stubborn, be tireless, and one day, it will be yours. Posted 4 years ago by Zoe Hinis.